You guys... this is my 150th Feel Good Friday post! To celebrate I looked for an organization that's been around 150 years and found The Salvation Army. Odds are you're familiar with the red kettles you see outside grocery stores during the holidays and you may have even gone to the Salvation Army to donate, or buy, a couch, an outfit or some household goods. Yes, but what were they doing 150 years ago? It started with William Booth preaching to poor congregations in 1865 London. According to the history section of the website "Thieves, prostitutes, gamblers, and drunkards were among Booth's first converts to Christianity" and soon began preaching to others. It wasn't until 1878 that Booth renamed his "Hallelujah Army" the "Salvation Army". Their religious beginnings can still be seen in their mission statement today, which "is to preach the gospel of Jesus Christ and to meet human needs in His name without discrimination" but their work isn't focused on religion. As their tag line says it's focused on "Doing the Most Good". Again from their website, "Each year, thanks to generous donations, The Salvation Army serves nearly 30 million Americans - or one person every second - from a variety of backgrounds. People who come to us for assistance will be served according to their need and our capacity to help - regardless of age, gender, ethnicity or sexual orientation." Their services include those you might expect: hunger relief, housing and homeless services, adult rehab and assistance for the elderly, veterans and youth. They also provide prison ministries, missing persons services, emergency disaster relief and work to combat human trafficking! Money you drop in the red kettles goes to support all of these programs as well providing "Christmas dinners, clothing and toys for families in need, including families of prisoners." You can get details on any of these programs here. There are tons of inspiring videos you can watch on The Salvation Army YouTube channel. Then, if you want to support this organization that's been going strong for 150 years, you can donate your money, items or time. 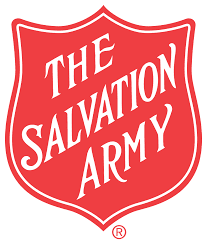 As always you can stay in the social media loop (certainly not an option in 1865) by liking their Facebook page and following them on Twitter @SalvationArmyUS. 150 years, 150 posts... thanks for celebrating this Feel Good Friday with me and The Salvation Army!